The Philadelphia Eagles have announced that they’ve agreed to terms on a three-year contract extension with edge defender Brandon Graham, which will keep him in Philadelphia until 2021. 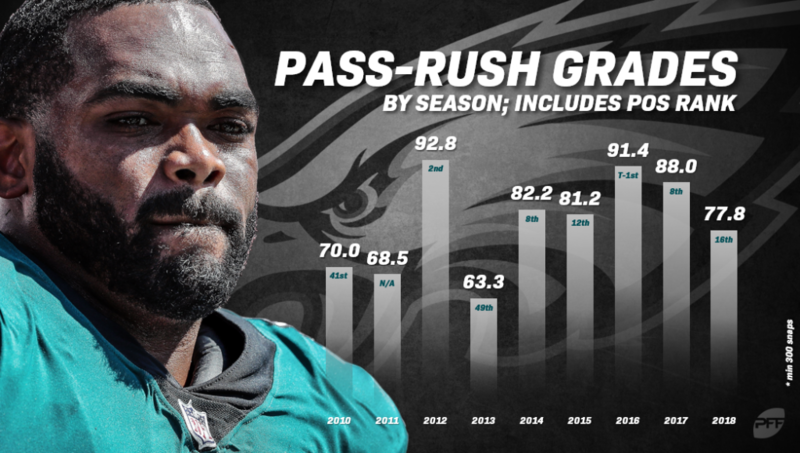 The longtime Eagle was set to hit free agency after he ended the 2018 season ranked just 98th on the NFL sack leaders list, buried beneath a wealth of pass-rushing talent that is also looking to cash in this offseason. But despite Graham falling behind players like Frank Clark (13.0 sacks), Dee Ford (13.0), Demarcus Lawrence (10.5), and Jadeveon Clowney (9.0), the Eagles chose to look beyond the sack totals — and quite rightly so — because while he hasn’t managed to the bring the opposing quarterback down at a high rate, Graham is still one of the league’s most underrated talents at the position. In fact, he’s arguably one of the most consistent pass rushers of the PFF era. We’ve said it before, and we’ll say it again: The value of pressure is undeniable, but it’s not all about sacks. Last season, quarterbacks saw a 35.2-point drop off in passer rating from their clean pocket attempts to their attempts under pressure, as the 102.2 passer rating from a clean pocket fell all the way to just 67.0 on the attempts when they were moved off their spot. That’s not all: When the quarterbacks were under pressure, they averaged just 6.3 yards per attempt compared to 7.5 yards per attempt when they were kept clean, and their turnover play rate almost doubled from 2.6% from a clean pocket to 5.1% when they were under pressure. Sure, the most valuable pressures are those that result in sacks or fumbles, but there is inherent value in a player that can consistently win pass-rushing matchups to get in the face of the quarterback and affect the play, regardless of whether or not the quarterback ends up on the ground.